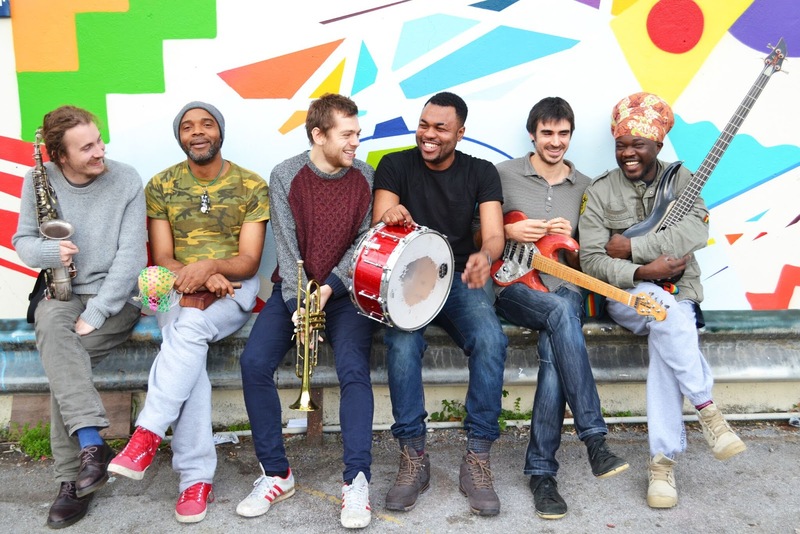 Congolese jazz ensemble Kongo Dia Ntotila talked to Alison Bentley about how their music has developed, their gig at London’s Rich Mix (24 May) and their forthcoming album 360°. Kongo Dia Ntotila describe their music as "Afro-joy", "Congolese music with a more flexible jazz sensibility". Bassist and singer Mulele Matondo grew up in the Democratic Republic of the Congo (DRC.) The title of the band’s forthcoming album, 360°, reflects his belief that "all music takes you full circle back to Africa". Matondo started a course at Leeds College of Music, which jazz guitarist John Kelly was teaching on. Kelly: "By the end of the first lesson, I could tell he was a really good musician. He showed me some stuff and we taught each other for a few years – it just grew out of that really." Kelly’s background was in "bop to modern jazz"; Matondo taught him about Congolese music, and the intricate patterns of seben (or soukous) guitar. "Something happened in my brain that opened up a new door." They moved to London, and along with Matondo’s old family friend, Congolese drummer-singer David Lessie, they made their 2012 album Congo Dia Ntotila, Seben Steps to Heaven. But they felt they couldn’t reproduce their overdubbed style live. Everything changed when they were joined by trumpeter Mike Soper and alto player Will Scott, whom Kelly knew from the London jazz scene. Kelly explains: "Our idea was that the horns would play in the breaks, like in the early years of Congolese rumba. Before Sakuba Diala recently joined the band, I was the only guitarist, so they had to play a much more interactive role – we didn’t have that cushion of guitars." Trumpet and alto together seem to sound like more than just two horns. Matondo: "They’re not just playing the melody, they’re part of the rhythmic foundation of the band." They play solos, even bringing in free jazz, sometimes creating compositions out of live improvisations. Matondo: "We don’t write music – we play by ear, 'cause this music is very complex." In the new album, he brings dance rhythms from the many African countries he’s lived in. For example, "in Zambia, I played with one of the great players, Kris Chali. of Amayenge. I even dedicated a song to him: Mbongo." The band’s name Kongo Dia Ntotila refers to the ancient Kingdom of Kongo, spanning what’s now several countries, and Matondo believes Congolese music has influences all over Africa and beyond. The track Agbwaya (aka Agbaja) has a rhythm he calls "the mother of the clave": "a typical rhythm which has moved to Cuba, with slaves who were coming from the centre of the Congo, and then west Africa." Matondo argues that the Kinshasa standard Mutwashi, with its dominant 7th chords, reveals Congolese music as the origin of the blues. "People tend to link blues to Mali, but never Congo – it was a transit point from east to west." He wants to return to a time when Congolese music dealt with "social and political issues… Nowadays music has become more shallow." Kinshasa Makambo is about a woman who lost everything when widowed; tradition dictated that her husband’s family should take everything. One track attacks musical "faux bosses" who didn’t pay Matondo for his musical work, and even refused to credit him on recordings. The reggae track Na leli means "I cry" – for Africa. But the mood is upbeat, led by the sweet church-influenced vocals of Lessie, which contrast with Matondo’s throatier style. Feti means "party" and Koupe dekale is full of energy. Kelly describes the grooves: "The guitars and the bass and drums play a very complex interlocking role. In traditional African music, different drums would have a different timbral and melodic role. The melody inside the rhythm is something that in modern music gets overlooked. In Congolese music, guitar, bass and drumkit play the roles of the different types of drums." New album 360° will be out in June.